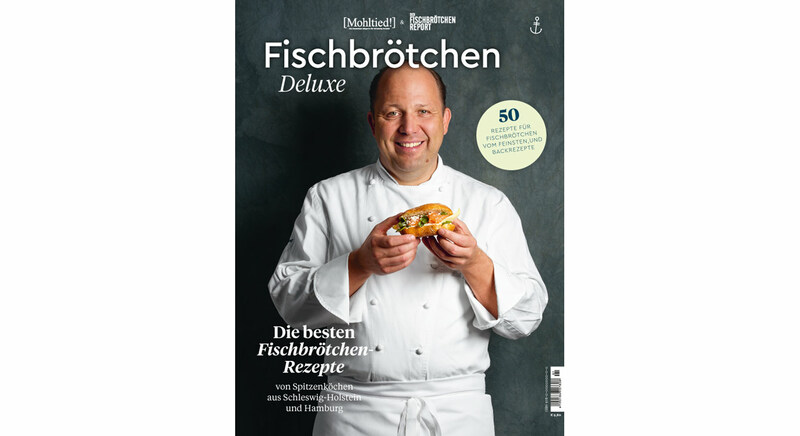 The food magazine “Fischbrötchen Deluxe” is a tribute to the classic North German snack. * In the periodical, 25 gourmet chefs present their exclusive recipes. In addition to appetizing photos, the elaborate typography also plays a critical role. LiebeGerda, which has a spontaneous look and feel, fits the food theme perfectly, adding a fresh touch to the recipes. LiebeGerda simulates fluid handwriting. The connected letters are characteristic of the font. In order to use the font as it was designed, the kerning settings in Adobe InDesign are decisive: you have to select metric here (default). 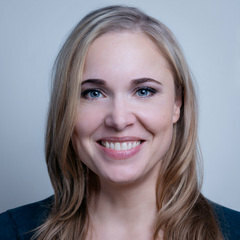 This ensures that the OpenType features run smoothly and that the connections between the letters are clean. In addition, the spacing in mixed setting should not be changed (default 0) so that connections link to each other perfectly. After I’ve created the form of the headline text, I start the fine tuning. First, I select the lines and put a tick in the character palette for ligatures. LiebeGerda controls context-based variations for glyphs using the ligature function. At least three variations per letter provide for variety and create the impression of living handwriting. Repeated glyphs in one word are avoided, like the “e” and “I” for “Dillgelee” in this case. In the next step, I select all letters again and go to the OpenType menu item “Format sets” and select the Swashes set (Adobe InDesign CC 2017) or Set 2 (Adobe InDesign CS6). The heading is now full of swash letters. Since I don’t want to overuse the effect, I go back a step, select specific letters and put a check mark next to Swash in the OpenType menu. LiebeGerda has a separate set of capital letters for upper case typesetting. They are somewhat simpler, without frills, and can be activated via Capital letters in the character palette. The term “LACHSFORELLE” contains two instances each of “E” and “L”. Clicking Ligatures displays contextual alternatives. In the third example, stylistic alternatives of the letter “e” and a catchword provide for excitement. After I’ve selected the two lines of text, I access the format sets in the OpenType menu. Clicking on Stylistic Alternates or Set 1 changes the basic form of the lower-case “e”. In the next step, I mark the word “und”. Using the catchword feature changes the word into a visually attractive filler word. LiebeGerda offers more than 1,200 glyphs in all four styles. 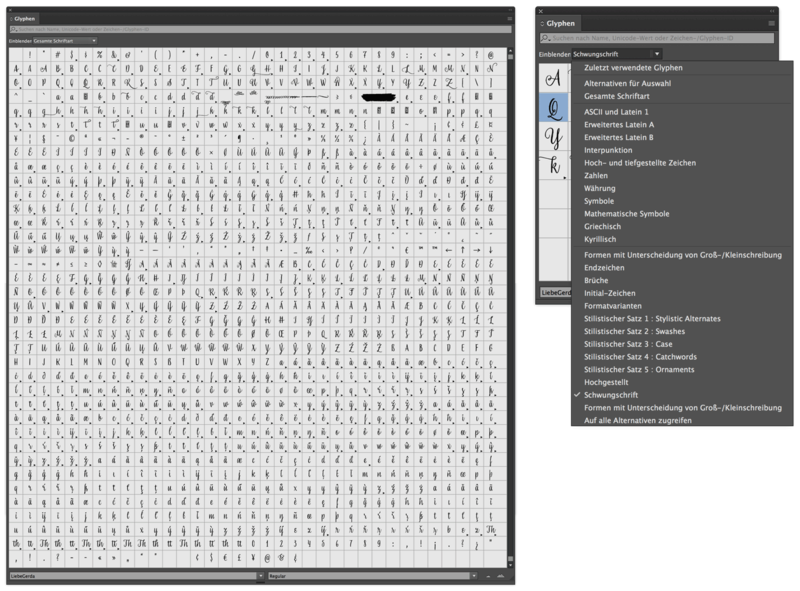 The glyph palette in Adobe InDesign provides an overview and enables the targeted search of individual characters. It is easy to be overwhelmed by so many glyphs. In this case, the drop-down menu provides organization: you can display the glyphs based on type of character and OpenType function. * The magazine will appear at the end of May 2017 at the newsagents in Hamburg and Schleswig-Holstein. The publishers are [Mohltied!] and Der Fischbrötchen Report.